Formerly made by the Flecto Company, Rust-Oleum is now the company that produces and sells Varathane. You can buy it through Amazon.com or from local hardware stores. It is a water based polyurethane FINISH (not a varnish, laquer, polish or floor wax) that works very well with wood, paper, fabric, and other art and craft media including polymer clay! This acrylic product has proved compatible with polymer clay brands that include SculpeyIII, Premo, FIMO, Cernit and others. Some users find that Kato Polyclay pieces may need to be treated with a alcohol wipe-down or very light application of Liquid Kato Polyclay before using Varathane. (Try that if the Varathane is beading up). Throughout 20+ years of testing, Varathane has held up through heavy wear on beads, sculptural pieces, and more! Polymer clay users want to make sure to get the water based form of Varathane as the oil based versions will react chemically with polymer clay over time, and may stay sticky or cause long term degradation of the clay. I use it as my applied finish of choice–if I apply anything at all, it is Varathane. My beads and jewelry are either left naturally matte or hand buffed, or they are given a coating of Varathane. You can bake it again, and it doesn’t hurt the shine…in fact it seems to sometimes “set” the coating, and minute brush marks disappear! Sometimes reheating is the only way to get my beads off of the skewers, especially after glazing them–the warm beads pull off easily. bake at no higher than 200 degrees F. for 5 minutes and ventilate thoroughly. Best results are gotten with brushed on applications, not dipping. The thicker coat that forms from dipping can result in the finish peeling away, particularly in humid climates. Baking again at 200 degrees can help “set” a finish. Use a soft brush, and do NOT wipe the brush on the side as that loads bubbles. The gloss gives a glass-like shine, and brings out the most depth in colors, particularly in the pearlescent or “glamour” clays. It seals and protects powders and metallic foils (leaf) on the surface of clay pieces. You can mix it with acrylic paints, pigments, or Pearl-Ex powders to make stains and antiquing finishes (for faux stones, ivory, also for faux enamels/cloisonne–see sample stains above). It doesn’t smell bad. It’s soap and water wash-up for brushes and dries fast. Use a good quality hair bristle paint brush and apply to cooled clay, and you won’t get streaks. Don’t wipe the brush against the side of the can and you will avoid bubbles too. It also has a UV protectant and DOES NOT yellow on polymer clay (my beads are fine, even after 20 years). The gloss version works as glue in mosaics, particularly if it is old and has dried and thickened up a bit. Bryan tiled a guitar this way, using cane slices. We’ve used it to apply tiles to furniture. It helps to apply top coats as well. 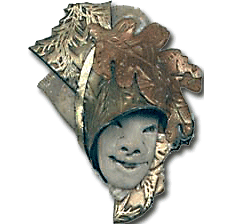 It can be used with paper and other media–cloth can be saturated and draped, then allowed to harden, and used with polymer clay sculpture, as a low-weight armature or form, or as decorative add-ons. It can be blotted with a makeup sponge to give a more matte effect. NOTE–if you use this product to coat original artwork, it may interact with your pigments or papers—do a small test piece first, and check it after a month or two, and again after a year. I usually pour some into a small glass or plastic jar with a tight sealing lid jar and work from there so as to minimize contamination and evaporation. Dip some out with a small cup (plastic shot glasses are inexpensive and great for craft use like this!) and you won’t get Varathane on the rim of the container, so it will seal again much tighter than if you start to build up residue. A quart lasts me about a year, and I’m a heavy user. It also comes in gallon containers, and I like to get the larger sizes to use with mixed media projects that include dipping fabric or finishing big mosaic pieces. Now Half Pints are available, and this makes using Varathane on small scale projects even more economical and easy to do! When using Varathane to mix stains or as a base for paint, you will need to stir before using as powders and paints settle. Also make sure to stir the Satin and Semi-Gloss versions before using–to get those effects, the particulate matter must be kept in suspension. However, be aware that the Satin and Semi-Gloss do not seem to adhere to the clay nearly as well as the Gloss version does. There is something in the satin and semi-gloss that makes it scratch off easily, which the gloss does not do. To get a matte effect while still using the Gloss version, try blotting the wet surface lightly with a makeup sponge. This breaks up the shine yet still protects inks, foils, and powders when needed. When I first starting using polymer clays 25 years ago, there was no information available (that I could find) about glazes, coverings, etc. SO…..after the Great Bead Disaster (as I watched 6 months of production bead making get mushier and stickier as the polyurethane and nail acrylics I had tried as finishes ATE the clay… several months later) I learned to TEST the reactions over months and years before committing. For over 15 years I have been very pleased with a product called “Varathane”. This product is now called: Water Based Varathane Polyurethane Interior but the formulation is unchanged. Only the label has changed. The Varathane label has a new look, but the protective qualities and ease of use remain unchanged. Varathane still includes a UV protectant that inhibits yellowing of the surface and discoloration or weakening of the clays. It still works chemically by way of an Inter-Penetrating Network. 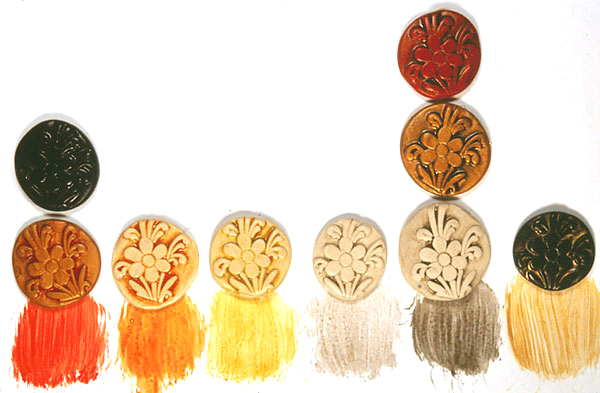 What IPN means to polymer clay artists is that it goes into (not just on top of ) the polymer clay. FIMO lacquer will flake away, the Liquitex peels off in a “skin” and the Varathane is fine. Tests using the Semi-Gloss and Satin seem to indicate that the additive that flattens the shine also interferes with surface penetration. Varathane is far LESS expensive and much MORE effective than other products I have used to glaze the surface of polymer clays. It withstands the tests of time and rough handling. Note—Our research shows that the aerosol form will work with baked polymer clay without reaction over time. I have 20 year old test pieces that have not changed or become sticky. Your results may vary…..and I’ll report back on mine! 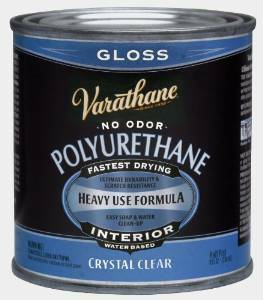 Look for the words “Water Based Varathane Polyurethane Interior” as there are also oil based products by the same manufacturer that don’t work well with polymer clays. We use ONLY the water based kind. One advertising booklet I have says they were voted the “number one waterborne clear finish by a leading consumer woodworking magazine”. Varathane is available in many hardware stores including Lowe’s, ACE, and Home Depot stores on the West Coast. If your local hardware store does not yet carry it, ask them to do so! Most stores will be happy to special order it for you if you buy a minimum quantity. To help customers find local outlets for Varathane, Rust-Oleum is creating a database available from their site.